NM-2201 (also known as CBL-2201) is an indole-based synthetic cannabinoid. Thus, it is presumably a full agonist and unselectively binds to CB1 and CB2 receptors with low nanomolar affinity. Also, it is the potent synthetic cannabinoid (CB). NM-2201 has Ki values of 1.0 and 2.6 nM for the central cannabinoid (CB1) and peripheral cannabinoid (CB2) receptors, respectively. Little to no research data available on this chemical makes it impossible to describe it’s properties in detail. 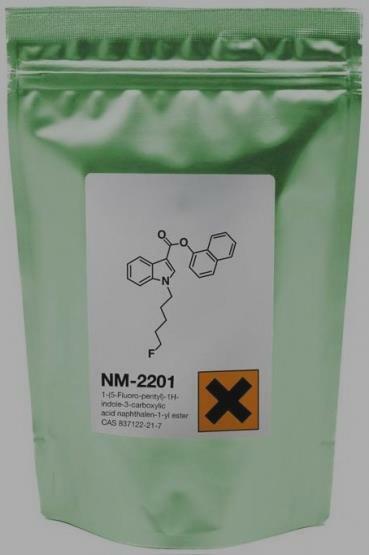 NM-2201 is a synthetic cannabinoid similar in structure to AM-2201, differing by an ester linking the 3’ position to the naphthyl group. This drug was discovered by Alexandros Makriyannis from Northeastern University.The physiological and toxicological properties of this compound are not currently known.This product is intended for forensic and research applications. NM-2201 is sold for research purposes only and is not be utilized for any other purposes. It is used in vivo diagnostic purposes, in foods, in drugs, in medicinal devices, and/or cosmetics for humans and/or animals. This chemical has a systematic or IUPAC name of 1-(5-Fluoro-pentyl)-1H-indole-3-carboxylic acid naphthalen-1-yl ester. Also, it has a chemical formula of C24H22FNO2 and an exact mass of 375.16.